The job of waiting at a restaurant or a high-end hotel can be quite demanding. While on one end there is the pressure of attending to the customers and looking after their comfort, there is the constant need for running their respective sections effectively and efficiently in a tidy and organized manner and to ensure smooth service at all times. 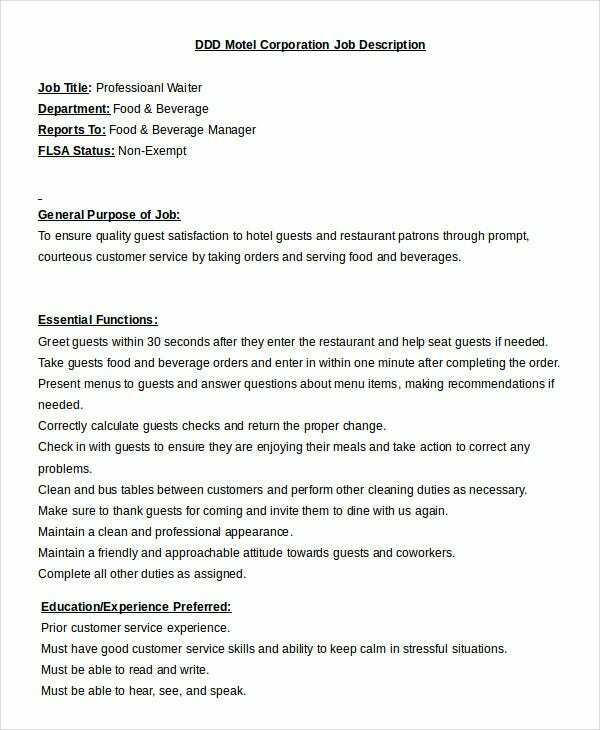 Should you need to hire waiters for your hotel or restaurant, the below Job description samples can be quite helpful in jotting down your requirement. 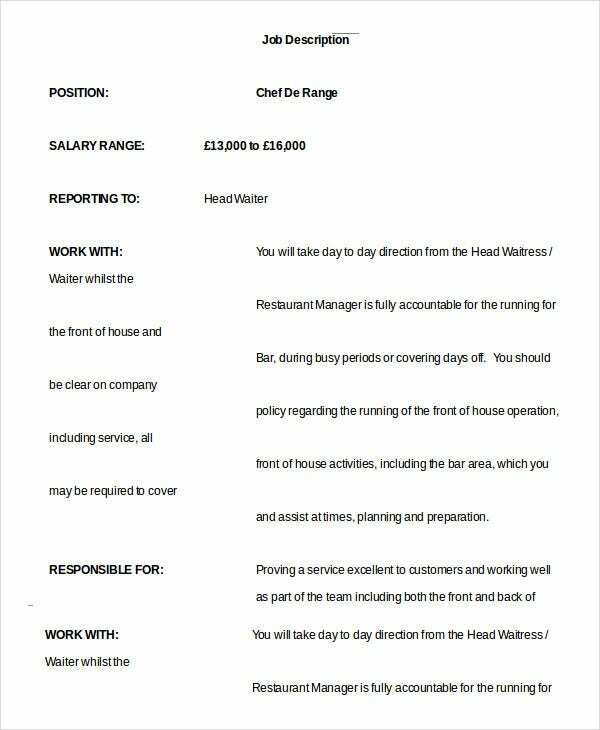 The Head Waiter Job description mentioned here lists the aspects of individual expertise, customer service and working as a part of the team including both the front and back of the house. 1. 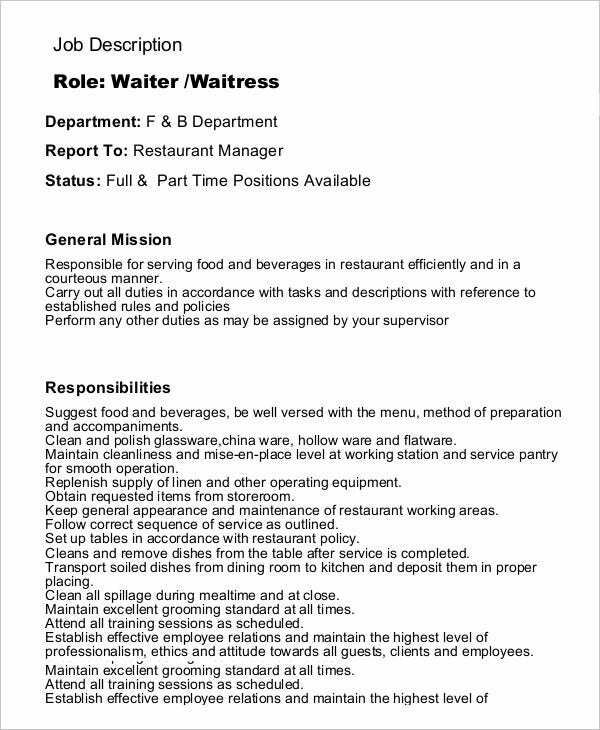 How to use the Waiter Job Description Templates? 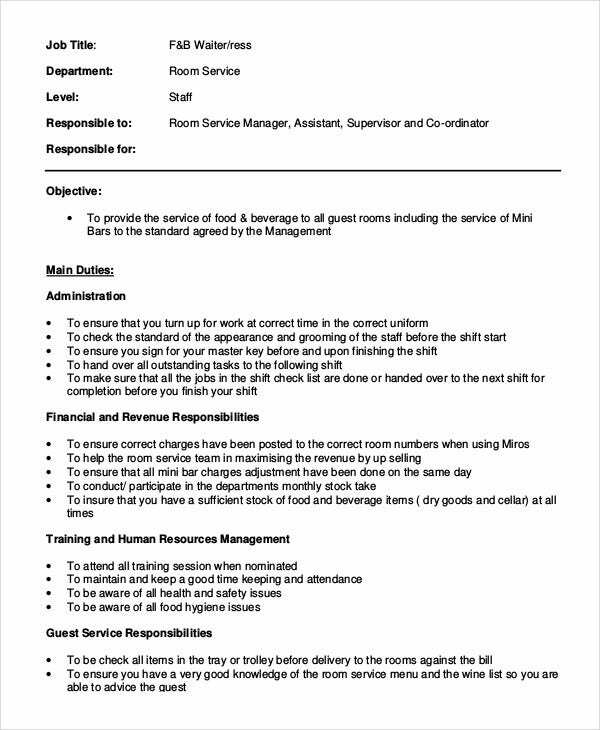 The waiter job description templates attached here give you a detailed insight into the expectations and complexities of this particular job role. Based on your requirements, you can select one and create your own waiter job description criteria worksheet and recruit the best of talents available in the market. This way, you do not need to spend a long time pondering over creating the document from scratch. These templates created by the experts encompass every aspect of a waiter job role so that you do not have to look elsewhere to create a robust document for the job role of a waiter. 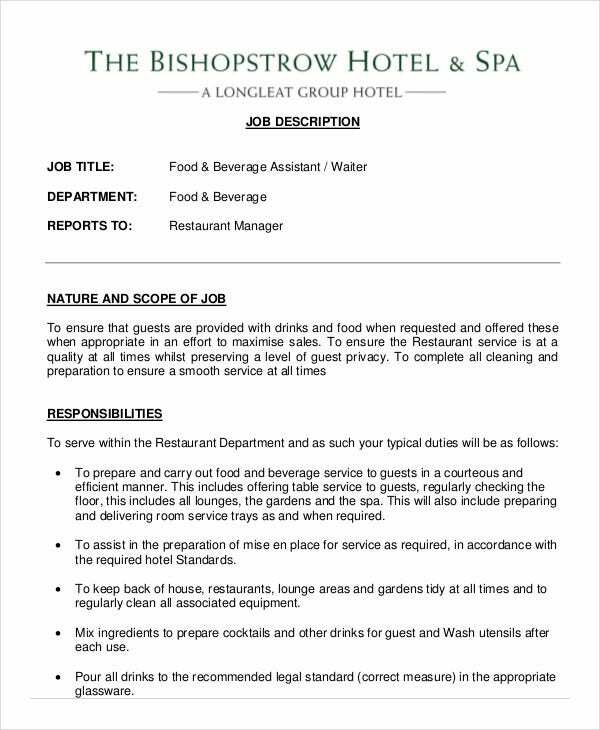 The following enlisted description is a detailed waiter job criteria required for servicing in a high-end hotel/bar. 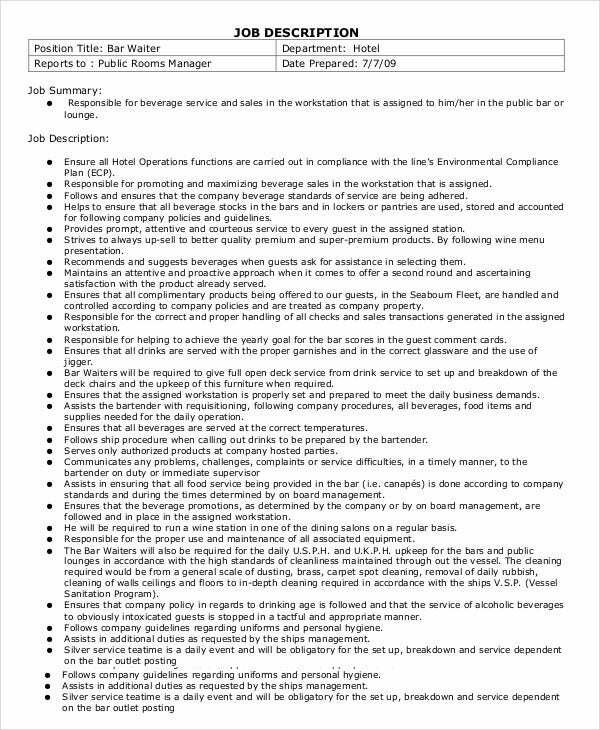 This template is an exhaustive list of the skill sets required by a bar waiter. The Bartender is responsible for providing servers and guests with drinks in a consistent and efficient manner and therefore, this template can be effectively customized to sum up the job requirements of this profession. 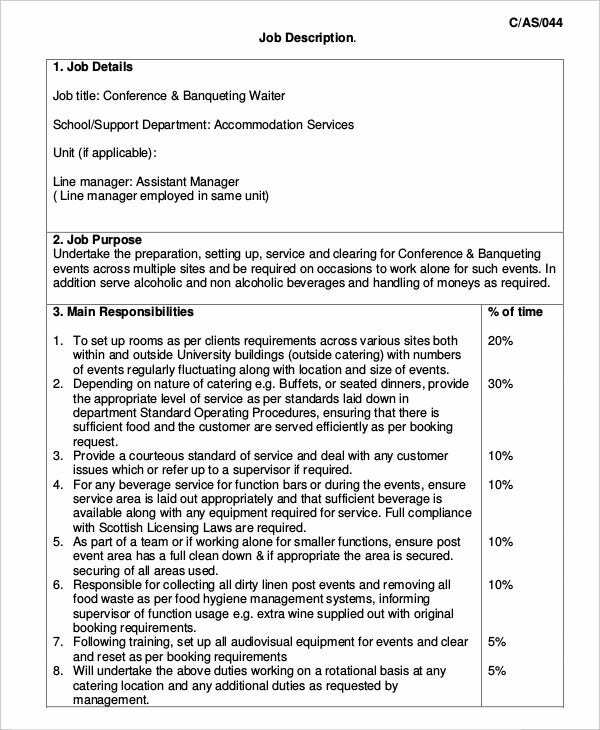 The job demands described here in the Professional Waiter Job Description are representative of those that must be met by the waiter to successfully perform the essential functions of the job. 2. 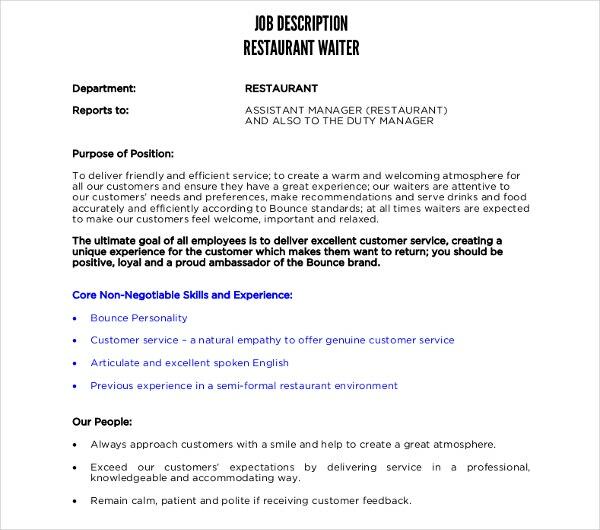 What are the benefits of using the Waiter Job Description Templates? Waiters play one of the most crucial roles in running a successful restaurant. 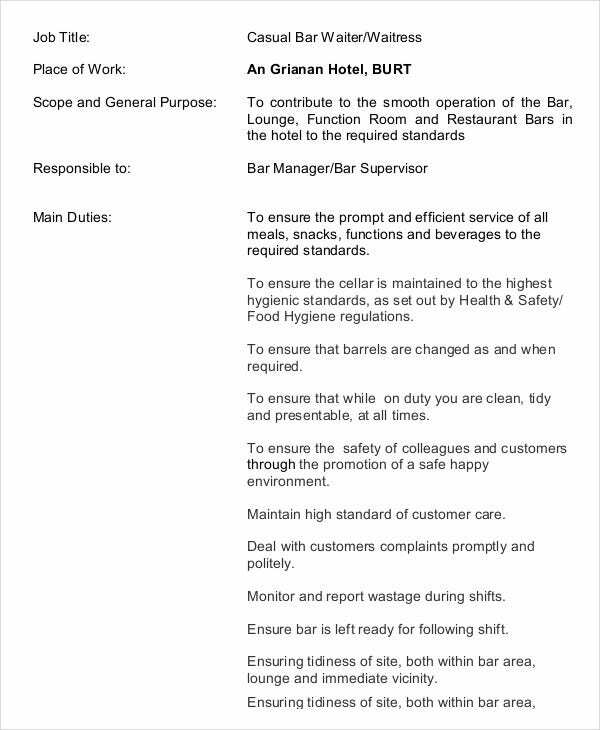 The myriad job responsibilities of a waiter include maintaining high standards of quality control, hygiene, and health and safety for the bar and the front of house team apart from attending and serving the guests and customers. 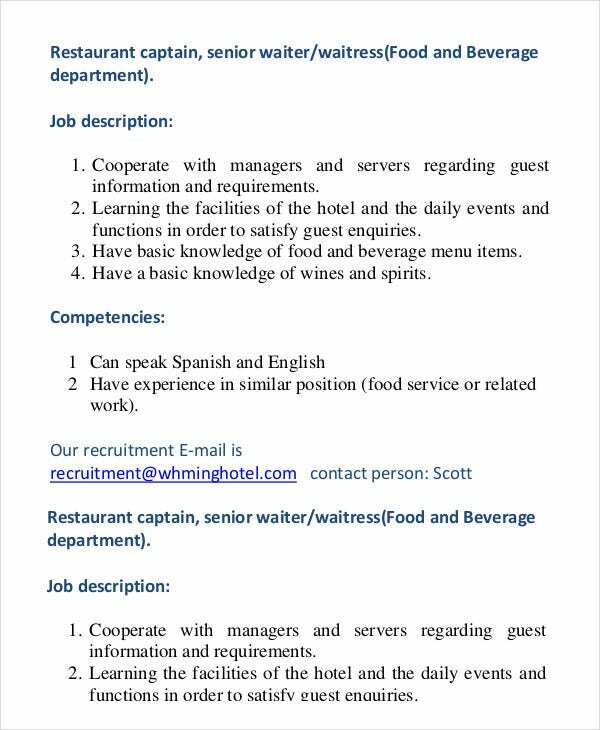 If you are looking to hire waiters for your hotel, the below templates can provide you with an exhaustive guideline on what to expect from the job role you offer. These templates are super easy to edit and personalize and you can conveniently print them out anywhere you wish. You may also see Customer Service Job Descriptions. 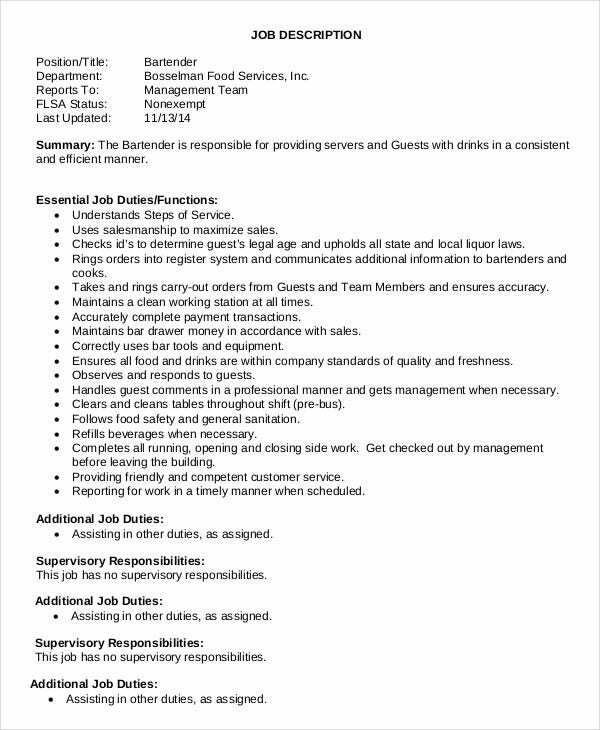 The templates attached here are so easy to work on and you will never again need to hire an expert or a professional to list the waiter job roles for you. These files are fully editable and equipped with easy customizing and printing features so that all you have do is download, edit, and print them.